First of all, we would like to thank the Cesar E. Santos Real Estate Academy for alerting us about CMO No. 28. We’re certain that people are getting stressed, especially since the RESA Law IRR (RA 9646) talks about requirements you need to fulfill before you may take the Real Estate Brokers’ Exam. In RA 9646, you need to be a college graduate… until such time that there is a course on real estate. Well, what happens now that the CHED has published CMO No. 28 and describes the BS REM course? Question #1: Which schools are going to offer the BS REM course starting June 2012? We will publish it here as soon as we get the info. Question #2: Does this mean the PRC will not conduct Real Estate Brokers’ Licensure Exams between now and the year 2016, when we will have the first batch of BS REM graduates? We do not speak for the PRC. Our educated guess is, the PRC will not close the Examination Room doors for four (4) long years, because people will complain. Question #3: I’m already a college graduate, but I want to become a licensed real estate broker. Do I need to enroll in this 4-year course? What, I need to go back to college again?! If you look at the pie chart above, you’ll notice the breakdown of the 164 units (BS REM). From the above, you can see that the main course is 39 units. Or about two semesters (with one overloaded sem: 18 units in the first sem, 21 units in the second sem). Of course, we cannot assume that those first 18 units will all be available in the 1st sem. Neither can we assume that the remaining 21 units will all be available in the 2nd sem. It may take you more than 1 year to complete those 39 units Real Estate Professional core subjects. Question #4: I don’t have time to invest more than 1 year of life for the REB Exam. What can I do? There’s going to be a 120-hour Comprehensive Real Estate Seminar and Review (CRESAR) that will begin on Friday, November 25, 2011. The venue is Makati City, and the cost is only P20,000. Slots are very LIMITED, so you will need to deposit P6,000 to secure your seat. If you would like more information on how to reserve your slot in the November 2011 CRESAR, please email your Full Name and Contact Number to RealEstateSeminarAndReview@GMail.com (please place in the subject line CRESARNov2011). You need to earn 120 units in real estate subjects, and some people are complying with this requirement by attending a 120-hour, face-to-face CRESAR. They will get a notarized Certificate of Attendance, which they can then present to the PRC when they apply for an Examination Permit for the upcoming Real Estate Brokers’ Licensure Examinations. We haven’t seen any official PRC announcement. All we’ve seen are various CRESAR service providers talking about a March 18, 2012 REB Exam. To help you reduce your stress, improve your understanding of real estate concepts, and remember the information longer, we invite you to join the RESAR Online Review. This will help boost your confidence, as well as reveal to you techniques that other people use to help you score higher in the REB Exam. For more info, please join the RESAR Online Review Announcement List for more details. Simply type in your Full Name and Email Address in the subscribe box. When will you publish the list of universities that will offer BS Real Estate Management? Can you please send it to my email. Thank you. [From the RESAR Admin] Hi! We haven’t seen any definitive list of universities offering a course in BS REM. A quick Google search shows the University of Cebu, but that webpage did not specify the course content. how to take the real estate appraisal exam? what are the requirements? do you have any reviews or seminars being offered? [From the Admin] Hello! If you are working at a real estate company, perhaps they can issue you a certificate covering the 60 hours OJT. 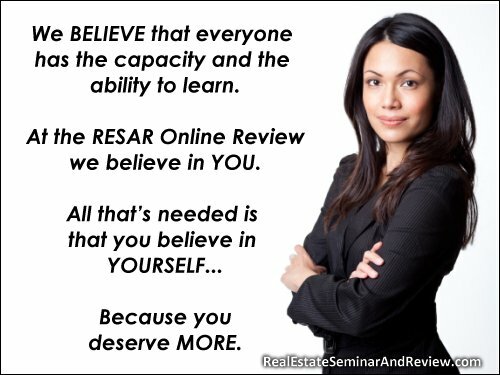 If not, you can enroll in a 120-hour comprehensive real estate seminar and review (CRESAR). Thanks! Hi, I am a registered midwife and have a diploma and passed the Midwifery licensure exam. Am I qualified for the real estate broker’s exam? [From the Admin] Hello! Is your diploma for a college degree (at least 4 year-course)? Thanks! Me cresar din po ba sa cagayan de oro? [From the Admin] If ever we get info about CRESARs in CDO, we will publish the info online. Thanks! Gud day!I would like to inquire about the date of release of colleges/universities which will cater BS REM…As of now I am sophomore college student who worries regarding the RESA law IRR (RA 9646).Should the law will prohibit me to take the licensure exam for real estate broker after I graduate since the (CHED) already issued Circular Memorandum Order No. 28, Series of 2011?Kindly reply me on my email as soon as u have the details. [From the Admin] Hello! 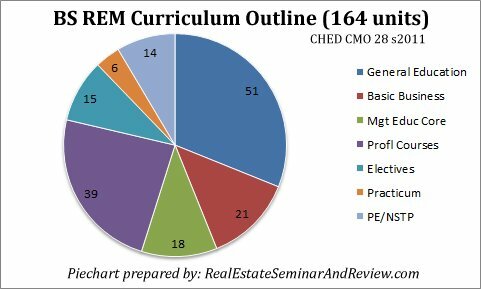 As soon as we get the list of universities that will offer the BS Real Estate Management (BS REM) course, we will publish it online. We don’t know if the PRC will still conduct Real Estate Brokers’ Licensure Exams between 2013 and 2016, or if they will wait for BS REM students to graduate in 2016 (or other college grads to complete their missing real estate-related units and graduate with a second degree in BS REM earlier than 2016). Thanks! Hi, its good to hear that PRC will continue to accept application for real estate exam, i support on that move, i think the PRC examination on real estate will continue and still the requirements in the IRR is still applicable. [From the Admin] Hello! Please take note that we haven’t read any official announcement from the PRC that they will indeed conduct exams between 2013 and 2016. Thanks! Hi. I’m a 2 years course graduate, can i take the brokers licensure exam? [From the Admin] Hello! Do you have a college diploma? Thanks. Hi, id like to inform you that INFORMATICS is offering equivalent to 4years degree in BS in Real Estate Management duly approved by CHED in compliance to CMO No. 28 in relation to RA 9646. im wondering if the PRC will pursue examination next year? [From the Admin] Hello! Only one school is offering the course? We wonder how many BS REM graduates there will be in 2016. Anyway, we’re waiting for the PRC to make announcements regarding the schedule of Real Estate Brokers’ Exams in 2013. Perhaps by October 2012, they will update their Schedule of Exams posted in their website. Thanks! With regards to CMO No 28 issued by CHED, if there’s any school that will offer BS REM then the conduct of examination for Real Estate by PRC will stop and have to wait until students graduated with BS REM Degree? thanks and more power. [From the Admin] Hi! We don’t know if the PRC will stop and wait, although it won’t make economic sense for them to stop conducting exams between 2012 and 2016. Thanks! [From the Admin] Hi! You need to submit a notarized Certificate of Attenandance, which you can get when you enroll in the face-to-face Comprehensive Real Estate Seminar and Review (CRESAR). Thanks! like to become a broker so, I am looking for ways on how how to become one. [From the Admin] Hello! It’s 12 days, at 10 CRESAR hours per day (8am to 7pm – meal breaks are not counted, hence 10 hrs), for a total of 120 hours – Comprehensive Real Estate Seminar and Review or CRESAR. Thanks!